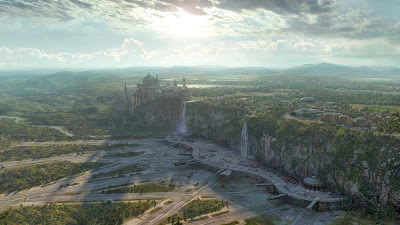 This amazing image is the work of Yanick Dusseault, and depicts the city Theed of the planet Naboo in the Star Wars universe. Naboo is known for its combination of advanced techonology with classicish (my word) architecture. The focus is on Theed's large royal palace, which supposedly had another tower added by each new monarch, to show his or hers... er... capability. Or something. Looks bloody beautiful, anyway.